NOTE: Produced in co-operation with www.GammonVillage.com. 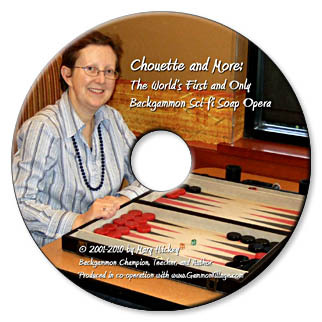 A compilation of 44 columns on chouette and backgammon in general originally published at GammonVillage, plus three essays about the qualities of a winner, the benefits of backgammon, and its psychological traps. Topics include: when to make the 5-point and when other objectives predominate, cube strategy against different kinds of opponents, rational risk-taking, and dealing with stranded anchors. Available at GammonVillage, Carol Joy Cole's Backgammon Boutique, or directly from the author, Mary Hickey, PO Box 27, Kirkersville OH 43033, e-mail thehick64@hotmail.com. $30 plus shipping. "To read this book, you need a computer but don't have to be connected to the Internet. The chapters appear as web pages, so unlike other books, it has diagrams in full color and in the later chapters where I used Snowie, the results are complete rather than summarized. The CD opens automatically when you put it in your CD/DVD drive, and you just click on the option to go to the Welcome Page, click from there to the contents, then click the link to whatever chapter you want to read. It also has Forward and Previous links at the beginning and end of each chapter. In the first few chapters of the book, I present some basic principles for chouette, and then in Chapter 11 the soap opera part begins, with you as part of the on-going story. Sometimes you play with millionaires in the mansion of a cast-off heir of an industrial robber baron, and other times at a coffee shop where quite a few of the players are fish. You visit the scary slum where an ever-nameless good player lives because he's trying to make a living from the game, with the predictable result. Another time, you get set up to play against a fearsome Dane named Lars Balrog. For a couple of chapters, you deal with an obnoxious accountant everyone hates to lose to  so much that they sabotage themselves, and proceed to lose to him all the time! The sci-fi part of the story happens when you fall into a time warp back to the 1970s, and play backgammon there knowing what you know about the game today." "Mary begain writing a regular column for GammonVillage in the fall of 2001. The column ran, with a two-year break, until 2008. Chouette and More brings together under one cover all of her columns. The book is issued on CD. The format's advantage is portability: the CD fits easily in your computer bag or you can copy it to your hard drive. The drawback is that many of the best places to readbed, bath, bar stoolare not places you'd take your PC. This is the only book devoted exclusively to chouette play. Not everyone plays for money. Some have moral reasons for eschewing the chou. Others stay away for financial reasons. Some find chouettes noisy or too smoky. But everyone should read Mary's book. Each chapter has three to five tough problems, so there are roughly 200 positions from which to learn. As Malcolm Davis, one of the most successful match players of all time, said: 'There is nothing as hard as good chouette play. '"Jake Jacobs, Flint Area BackgammoNews, August/September 2010.